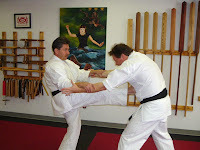 The front-kick is the most basic kick taught in karate, tae kwon do, or just about any striking style in martial arts. To execute, the knee is pulled up to waist-level (chambered) while the shin hangs down. The leg is then straightened to strike the intended target. Novices are taught to kick the midsection, but other targets include the shin, thigh, groin, or even head. In tournaments, Chuck Norris would fake a front kick to the gut, retract, then snap it to up the head for an easy point. Most practitioners either aren't that quick (or flexible), or prefer other kicks that are less detectable such as roundhouse, hook, crescent, and spin-around-back. 1. First he raises his thigh parallel to the floor. 2. Once the leg is chambered parallel to the floor, the leg kicks out and returns in a hinging motion, front front kick or rear front kick. This kicking method means the foot strikes out from the chamber and not slingshoting out as the leg/knee rises. It gives less time for the opponent to recognize the kick is coming. That also means there is less time to try and catch the leg. A "slingshot" style kick could be a telegraph if you're really sharp. Don Nagle, who trained under Shimabuku in the late 50s, supposedly could block a kick as it was rising from the floor with his forward foot! Now that's a neat trick. Personally, I'm too reflex challenged to pull this kind of move off. I've never seen anyone even attempt this. Attempts at catching kicks I've seen plenty, usually among beginners. In some dojo I've trained in catching an incoming kick is seen as taboo, even though (or maybe because) MMA players do it all the time. The time-honored way is to slip the kick (ideal) or block it with your arm. (The latter is widely taught in karate. Disclaimer: bad idea.) At any rate, I believe that chambering most kicks is good practice. As a last resort the raising knee could be delivered as a hiza-tsui (knee-strike) if your attacker manages to close the distance. The last video in the blog shows a very brief clip of the master performing what appears to be an application from the kata Sunsu, his creation and a form particular to Isshinryu karate. It is a front thrust kick (as opposed to the snapping variety) in defense of a double-arm grab. (The image above illustrates present-day exponents demonstrating this. )* In this scenario ma'ai or striking distance is minimal between you and the attacker. In this manner, the thrust "kick" is performed more like a push-off. The front kick, a basic technique that is relatively easy to execute, has viable self-defense applications and variations that shouldn't be given short shrift in lieu of so-called flashier kicks. * This particular bunkai of Sunsu is how it was originally taught to me by a high ranking instructor who trained on Okinawa. I believe it's the correct way. Since then I've visited a number of schools through the years seeing other things applied. It seems everyone has their own version of Isshinryu. † Donn Draeger 1974. Modern Bujutsu and Budo. [p. 75-76] Wheatherhill, Inc.